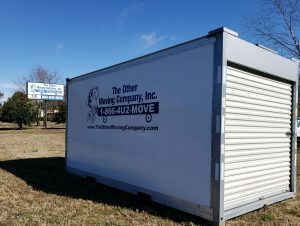 For both residential and commercial customers, The Other Moving Company offers unique storage container solutions. Whether you have an abundance of items or a small amount to store, we can accommodate your needs with a top-of-the-line storage container solution. Especially if you have a temporary storage need, storage containers often work better than using a conventional facility. Based on the type and quantity of belongings you need to store, one of our company representatives will determine the correct container size. With that done, we will deliver the container to your home or business, place it outside, and then give you the time needed to add things until finished or full. Although every customer relies on containers for different reasons, they work excellent when in need of storage space during a move, remodeling, or even decluttering. Regardless of your situation, this is a great way to remove items from inside your house or business. Just as with all the services that we provide at The Other Moving Company, we keep our prices on storage containers affordable. Instead of spending more money than you need to, consider this as a solution. While discussing different sized containers, our representative will go over all the pricing options, helping you select whatever fits your budget. Regardless if you need storage space for up to four rooms or a small 500 square foot space, storage containers are incredible. Our mobile storage solutions are great for all purposes, like storing items from your child’s dorm room over the summer. Just fill up the mobile storage container and we will store it for you in our secure storage facility. For more information on our storage container solutions, please contact us at The Other Moving Company.